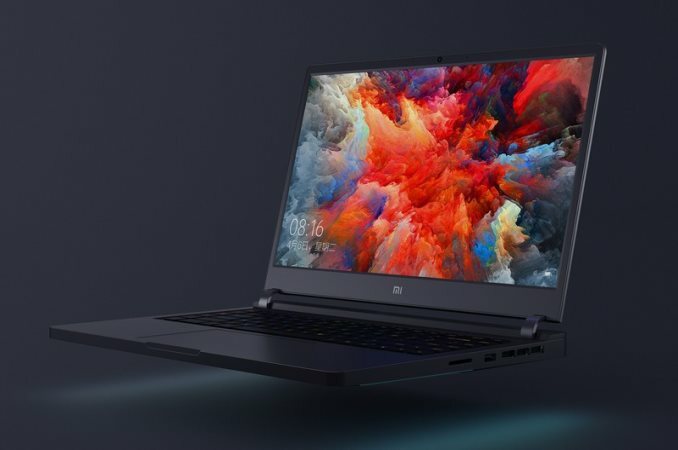 Chinese brand Xiaomi this week announced its new Mi Gaming Laptop, its first endeavor into the gaming side of laptops. The 15.6-inch Full-HD 1080p gaming laptop will offer up to a GTX 1060 6GB graphics card, 16GB of DDR4 memory, and a Kaby Lake i7 Kaby Lake processor. Starting under $1000 for the i5-7300HQ plus 1050 Ti variant, the Mi Gaming Laptop is searching for the user looking for a decent gaming experience without breaking the bank. The outside of the black aluminum chassis has a brushed aluminum finish and goes without a logo on the lid giving it a pretty unassuming, almost business-like appearance. The laptop measures in with a 15.6-inch 1920x1080 screen and weighs in around 2.7 kg. In order to add a bit of flare to the gaming oriented device, Xiaomi includes and four-zone RGB backlit keyboard as well as RGB illumination located on the bottom of the chassis. Outside of the lights, the only other things we see are I/O ports as well as four exhaust ports for cooling located on the side and back of the chassis. 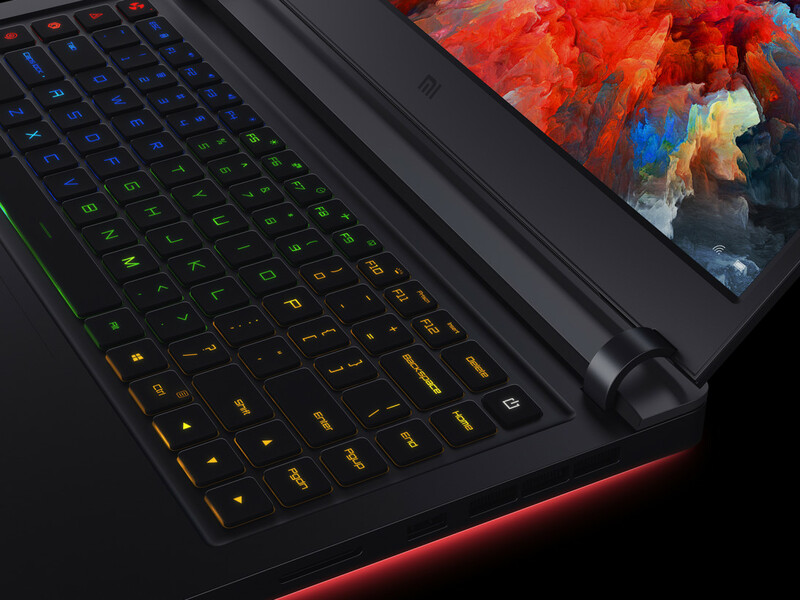 Internally, The Mi Gaming Laptop’s base configuration starts off with a 7th generation Intel Core i5-7300HQ, a quad-core with a base frequency of 2.5 GHz and a maximum turbo frequency of 3.5 GHz. The base video card is an NVIDIA GTX 1050 Ti 4 GB GDDR5 which should offer adequate gaming performance. The Mi’s 15.6-inch FHD panel has 72% NTSC color gamut with 300 nits brightness and the only panel choice. The device starts off with 8 GB of DDR4-2400 memory which is upgradeable to 16 GB. The high-end configuration steps up to an Intel Core i7-7700HQ, a quad core with hyperthreading and base speeds of 2.8 GHz, pushing a maximum turbo of 3.8 GHz. The GPU moves up to the faster GTX 1060 with 6 GB GDDR5. Memory capacity also doubles to 16GB DDR4-2400 as standard. Cooling any configuration is Xiaomi’s own 3+2 ‘large diameter’ heat pipe design and two fans which intake air from the bottom and exhaust out of the side vents. For storage purposes, the Mi Gaming Laptop is able to house two M.2 PCIe drives and a single 2.5-inch drive. These can be filled with any combination of 128 GB or 256 GB SSD as well as a 1TB HDD option, although Xiaomi does not state if these M.2 ports are SATA or PCIe. I/O connectivity includes four USB 3.0 ports, a USB 3.0 Type-C port, microphone and headphone jacks, an HDMI port, and a Gigabit Ethernet port. The Mi also includes 802.11ac Dual-band Wi-Fi with speeds up to 867 Mbps as well as Bluetooth 4.1. Dimensions 14.3" x 10.4" x 0.82"
The base model with the i5, 8GB DDR4, and 1050 Ti graphics will cost 5999 CNY while the top end i7, 16GB DDR4, and GTX 1060 combo will run at 8999 CNY. After taking out China's tax rate, this comes to a range of $815 to $1223. These are not available now, but will only be released in China with a Chinese version of Windows on April 13th. 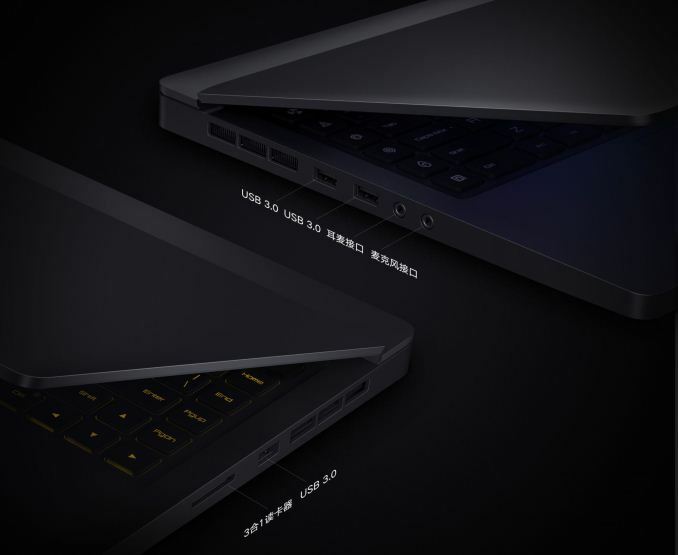 Xiaomi's previous foray into laptops include a Mi Notebook Pro with a Core i7-8250U and MX150, and a Mi Notebook Air, each with similarly aggressive pricing. My immediate thoughts are that only 8GB of ram is rather stingy for a gaming laptop. I'm also a bit concerned about the claim that it can only be upgraded to 16. I hope that's just the factory max, and not an indication that it only has a single sodimm slot; with 2 it should support 32gb using currently available modules. Skinny screen bezels and a top webcam is nice. At the listed prices I can't fault the pairing of an SSD and HDD. I'd like to see a 5th model with a 512 SSD and optionally no spinning rust; but if Xiaomi is intending to primarily sell to the domestic Chinese market that might be getting too spendy. If you're not seeing any difference between 4 and 8 gb, I can only assume you're either playing older/less demanding titles or possibly just at lower settings (this last one is speculation, I'm not sure if 720p/potato actually would reduce ram significantly vs 1080p/ultra). If only 4GB was enough, gamers wouldn't've lead the switch to 64bit windows over a decade ago when Vista came out and most major titles would still be launching as 32 bit instead of 64 only. Wow, it's like they actually want to sell those laptops to people that knows a thing or two!